You can run Java applications that use the Kafka Streams library without any additional configuration or requirements. For more information about how you can package your application in this way, see the Streams code examples. 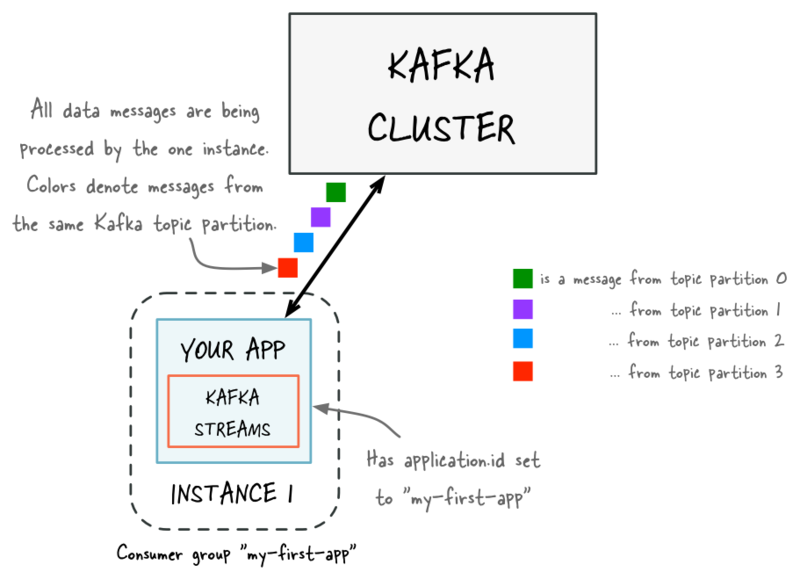 When you start your application you are launching a Kafka Streams instance of your application. You can run multiple instances of your application. A common scenario is that there are multiple instances of your application running in parallel. For more information, see Parallelism Model. When the application instance starts running, the defined processor topology will be initialized as one or more stream tasks. If the processor topology defines any state stores, these are also constructed during the initialization period. For more information, see the State restoration during workload rebalance section). Kafka Streams makes your stream processing applications elastic and scalable. You can add and remove processing capacity dynamically during application runtime without any downtime or data loss. This makes your applications resilient in the face of failures and for allows you to perform maintenance as needed (e.g. rolling upgrades). For more information about this elasticity, see the Parallelism Model section. Kafka Streams leverages the Kafka group management functionality, which is built right into the Kafka wire protocol. 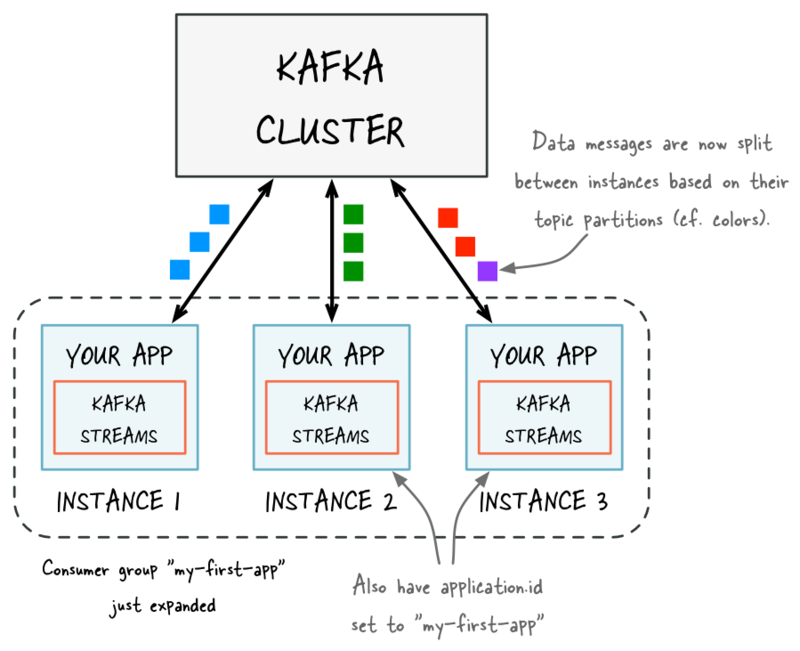 It is the foundation that enables the elasticity of Kafka Streams applications: members of a group coordinate and collaborate jointly on the consumption and processing of data in Kafka. 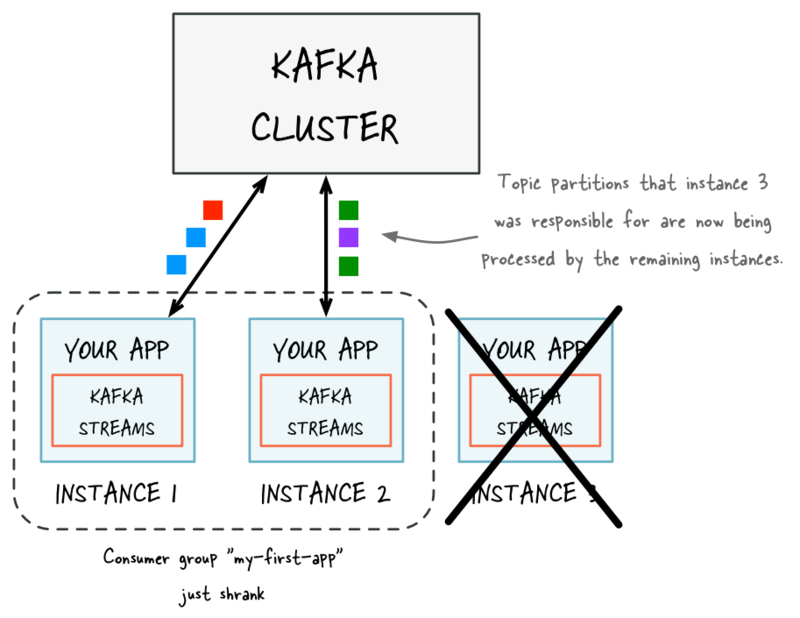 Additionally, Kafka Streams provides stateful processing and allows for fault-tolerant state in environments where application instances may come and go at any time. To remove processing capacity, you can stop running stream processing application instances (e.g., shut down two of the four instances), it will automatically leave the application’s consumer group, and the remaining instances of your application will automatically take over the processing work. The remaining instances take over the stream tasks that were run by the stopped instances. Moving stream tasks from one instance to another results in moving the processing work plus any internal state of these stream tasks. The state of a stream task is recreated in the target instance from its changelog topic. If no local state store exists, the changelog is replayed from the earliest to the current offset. This reconstructs the local state store to the most recent snapshot. If a local state store exists, the changelog is replayed from the previously checkpointed offset. The changes are applied and the state is restored to the most recent snapshot. This method takes less time because it is applying a smaller portion of the changelog. For more information, see Standby Replicas. The parallelism of a Kafka Streams application is primarily determined by how many partitions the input topics have. For example, if your application reads from a single topic that has ten partitions, then you can run up to ten instances of your applications. You can run further instances, but these will be idle. The number of topic partitions is the upper limit for the parallelism of your Kafka Streams application and for the number of running instances of your application. Data should be equally distributed across topic partitions. For example, if two topic partitions each have 1 million messages, this is better than a single partition with 2 million messages and none in the other. Processing workload should be equally distributed across topic partitions. For example, if the time to process messages varies widely, then it is better to spread the processing-intensive messages across partitions rather than storing these messages within the same partition.